Two new reports confirm that affordability is still a concern, even for those with health insurance. Families USA and the Kaiser Family Foundation both released reports about people enrolled in non-group plans (The Commonwealth Fund has a similar report). Non-group plans include all individual plans—those sold on the state exchange and in the individual market. These types of plans are initially attractive—the monthly premium is low, and fits in with a person’s budget. But when it comes time to use the health insurance plan, high deductibles and out of pocket costs prevent people from getting care. This is known as underinsurance—when someone has a health insurance plan, but upfront costs deter people from getting the care they need. 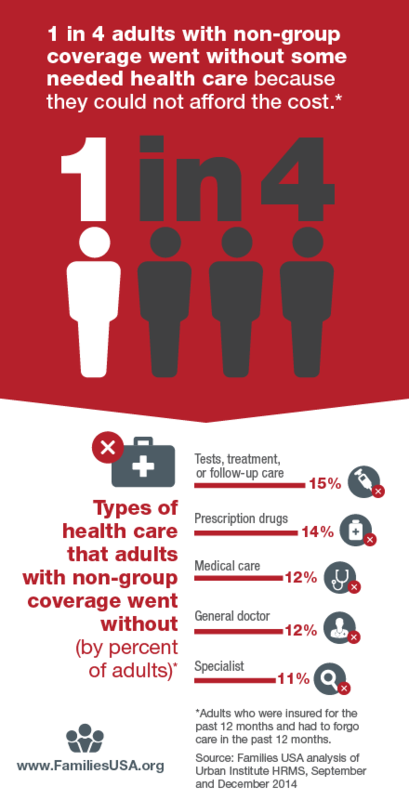 People may not get necessary tests done or fill needed prescriptions. This is a troubling trend—the promise of health insurance fades away for some when they need it most. We all deserve better.